Pixar's MONSTERS INC. has the distinction of the being one the nominees of the newly-minted 2001 Academy Award for Best Animated Feature (it lost to the first SHREK) recognizing, of course, that with the aid of CGI, there would be a torrent of bit/byte-based things, some of them potentially worth seeing. Certainly this one is; most Pixar films have been top-class. Of course, I'm in CARS 2 denial here, and it may not be long before we get MONSTERS INC. 2 with a similar prefab 007-spoof international-espionage plot tacked on (if found please return to Fred Flintstone). But for now MONSTERS INC. is a keeper, an entertaining, if overcalculated, whimsy about a world of cuddly monsters busily abiding somewhere out there, where a mighty corporation has made a science out of creatures popping out of bedroom-closet doors and spooking small children for a living. Despite the fear factor the milieu is always a cheerfully bright and pastel-colored palette that seems to be the Pixar signature (or is their PC operating system?). The monsters are grotesquely playful and toy-chest cuddly, a cross between Big Daddy Roth drag racers and Gahan Wilson (maybe with a little H. P. Lovecraft in there). And even though they perfume themselves with stench and dine at a restaurant named Harryhausen's, they're never sufficiently frightening to overturn the MPAA's G-rating. This may be the least threatening screen depiction in memory about the nature of terror. 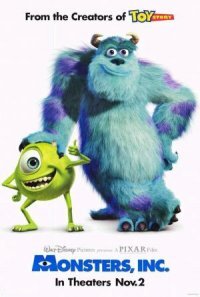 The top "scarer" is Sullivan, a bearlike plush-toy biped (voiced by John Goodman), with a wisecracking ambulatory eyeball (voiced by Billy Crystal) for a best friend. Togeher they work at Monsters Inc., a Seussian factory in which children's closet doors from all over the Earth are systematically maintained, entered and exited by monsters to keep the scares flowing. Although monster society exploits children, the worst thing that could happen would be for a kid to actually touch a monster, or enter the monster realm. Thanks to runaway ambitions of Randall (voiced by Steve Buscemi), a chameleonlike rival trying to upstage Sullivan, this very thing happens. Sullivan finds himself the unwilling caretraker of a little girl he dubs Boo, and the monster must protect the tyke from the decontamination stormtroopers of the Child Detection Agency and the attention of the scuttling, crablike company CEO (voiced by James Coburn, sounding a bit like James Earl Jones). One of the movie's true strokes of genius is making Boo pre-verbal and letting the monsters do all the talking. As with the TOY STORY pictures, there are moments when the digital caricatures become just as real and touching as flesh-and-blood actors. Here that's Sullivan's epiphany of the true consequences of his scaring behavior - although how he repents and reforms monster society is a bit of a deux ex monsterina telegraphed long in advance. The pace is brisk and the audio cast impeccable, with a script that almost never talks down to the grownups in the audience and tweaks baby-boomer memories with a guest appearance by a yeti who's a dead ringer for the Abominable Snowman the Rankin-Bass stop-motion animators foisted with the perennial "Rudolph the Red-Nosed Reindeer" Christmas special. And, yes, speaking of memories, there is a strong resemblance to LITTLE MONSTERS, a critically disliked, makeup-laden live-action Howie Mandel vehicle from 1988, which was kind of a BEETLEJUICE takeoff, about the kingdom of tot-tormenting boogeymen that abides under kids' beds. Odd that nobody remembers that one - or did the stormtroopers of Pixar parent company Disney quietly eradicate all traces of it and potential lawsuits? Just to prevent the Cleveland Movie Blog’s destruction at the hands of Magic Kingdom lawyers, I’m pasting in the FRENCH poster of MONSTERS INC. as an illustration, Mr. Ignizio; maybe the Buena Vista attorneys will think we’re still talking about existentialist Cinematheque art films.